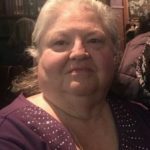 Janice Lynn Brown (Woodworth), 78, born in Ficklin, IL passed away on Apr 2, 2019 at home in Bellevue, NE. She was preceded in death by her father Edwin, mother Lillian, sisters Helen Marie and Betty Jean and brother Donald. She is survived by sisters, Ruth Karcher and Rae (Gary) Dalton; brother, Pete Woodworth; her three children David (Candy) Freeman, Pam Pulcini and Amanda (Ray) Nawrocki, 9 grandchildren and 15 great grandchildren. The family will receive friends for visitation on Monday April 8, 2019 1130am-1pm and a memorial service following at Morgan Memorial Home at 1304 Regency Dr W, Savoy, IL. Interment- Davis Cemetery, Pesotum, IL. A Celebration of Janice’s Life at Bellewood Courts- 1002 Bellewood Ct, Bellevue NE on April 13, 2019. Memorials to be directed by family. In only a few short hours of meeting her, I knew she was someone with a big heart, full of so much love. She was a ray of light that made me feel like she had known me my entire life. I’m glad I had the chance to meet her. She will be missed.